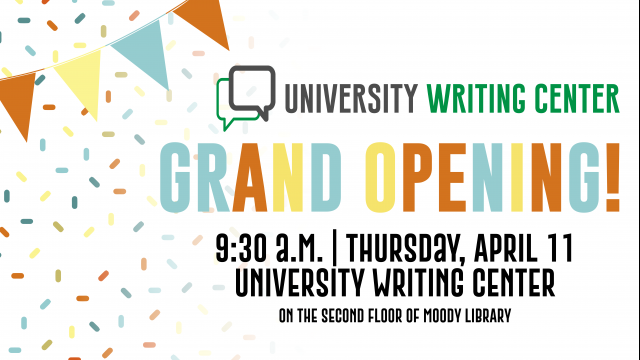 WACO, Texas (April 10, 2019) – On April 11, the University Writing Center (UWC) and the Baylor University Libraries will celebrate the grand opening of the UWC’s new location in Moody Memorial Library. The event begins at 9:30 a.m. and will feature light refreshments, door prizes for students and brief remarks from Baylor President Linda A. Livingstone, Ph.D.
After months of collaboration between the Baylor Libraries, the department of English and the College of Arts & Sciences, the UWC made the move from Carroll Science Building to Moody Memorial Library in February 2019. The move made it possible for the center to extend its hours and provide a larger space to serve more students, faculty and staff. The center employs a diverse group of staff and undergraduate and graduate students from many different majors and academic disciplines. This composition allows them to serve English writers as well as English language learners and international students. The new UWC space features a more comfortable and updated space on the second floor of Moody Memorial Library, complete with new furniture and refreshed carpet and paint. The center’s centralized location provides easier access for students of all disciplines and promotes a strong community of writers across campus. The University Writing Center’s services are available for a variety of writing projects, including but not limited to academic, technical, scientific, multimodal and digital writing, along with job application materials and theses. Writers are welcome to bring their work at any stage in the writing process. Consultants can work with clients to develop ideas, strengthen style and organization and perform minor or major editing. Online appointments are also available via the UWC website. The UWC’s services are free to students, faculty and staff. Walk-in hours are also offered from 11 a.m. to 1 p.m. on Tuesdays and noon to 2 p.m. on Fridays. For more information, or to schedule an appointment, visit www.baylor.edu/UWC. The College of Arts & Sciences is Baylor University’s oldest and largest academic division, consisting of 25 academic departments and seven academic centers and institutes. The more than 5,000 courses taught in the College span topics from art and theatre to religion, philosophy, sociology and the natural sciences. Faculty conduct research around the world, and research on the undergraduate and graduate level is prevalent throughout all disciplines. Visit www.baylor.edu/artsandsciences.